All marine mammals (such as monk seals, dolphins and whales) and sea turtles in Hawaiian waters are protected either under the Marine Mammal Protection Act (MMPA) or the Endangered Species Act (ESA), or both. The MMPA and the ESA prohibit any “taking” of marine mammals or endangered species in the U.S. Under these laws a “take” is defined as the hunting, harassment, capture, harm, pursuit, shooting, wounding, killing, trapping, capture, collection, or an attempt to do any of these things. Hawaii Marine Animal Response (HMAR) focuses its efforts on the protected marine species in Hawaii that are most likely to be encountered by humans due to their natural behaviors and habitat. These species include the Hawaiian monk seal, the Green sea turtle, the Hawksbill sea turtle, the Spinner dolphin and the Humpback whale. 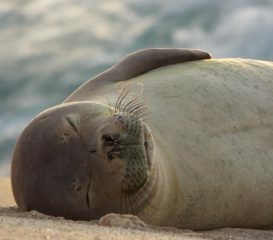 Of all marine mammals, the Hawaiian monk seal (ilio holo ika ua ua) is the most endangered in the pinniped family (seals, sea lions and walrus) in the western hemisphere and is listed as endangered under the Endangered Species Act. The Green Sea turtle (honu) is categorized as threatened under the Endangered Species Act while the Hawksbill turtle (‘ea or honu ‘ea) is categorized as endangered under the Endangered Species Act. The Spinner dolphin (nai’a or ka nai’a) and Humpback whale (koholā or koholā kuapi’o) are not currently listed under the Endangered Species Act but are protected under the Marine Mammal Protection Act. Extinctions are currently occurring at a rate that is unprecedented in human history. Each plant, animal, and their physical environment is part of an ecosystem and part of a much more complex web of life. Because of this, the extinction of a single species may cause a series of negative events to occur that affect many other species, including ultimately humans. Species diversity is part of the natural legacy we leave for future generations and those that come after us deserve the opportunity to enjoy the same natural world we experience. People cause most of the problems in the current health of our environment. But people can also positively affect changes in our ecosystems and help protected species sustain and recover by learning about the issues and changing behaviors. Get involved and help us in our important work in the preservation, recovery and stewardship of Hawaii’s protected marine species.